1. Donaghmore. Composite Cross. West Face. Detailed View of Shaft. Lower Panel. E1 Adam and Eve. This is a composite cross, consisting of the head of one cross and the shaft of another. The base measures 90 cm high and 1.45 m x 1.3 m. The end fragment measures 1.8 m high and 66 cm x 46 cm in thickness. The head is 2.03 m high and 62 cm x 48 cm. 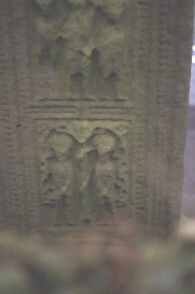 This is a detailed view of the west face of the composite cross at Donaghmore Co. Tyrone. This panel depicts an Old Testament scene, that of Adam and Eve 'Knowing their Nakedness' in the garden of Eden. This panel depicts a scene from the Book of Genesis 3:8. Adam and Eve are depicted on either side of the branching Tree of Knowledge, their hands are crossed in front front of them, hiding their nakedness. Historic Monuments of Northern Ireland 1, , Belfast (1983) . Roe, H. M., , ‘The High Crosses of East Tyrone. A Photographic Survey with notes on the Monuments’. In Seanchas Ardmhacha (1956) 2, 1, 79-89. Sexton, E. H. L., A Descriptive and Bibliographical List of Irish Figure Sculptures of the Early Chrsitian Period 1, , Portland (1946) .